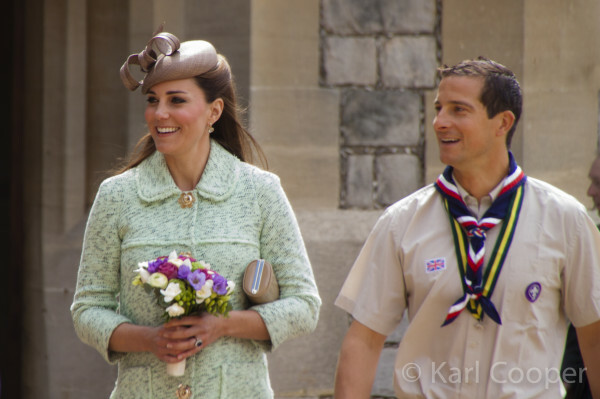 The Duchess of Cambridge attended the National Review of Queen's Scouts at Windsor Castle today. 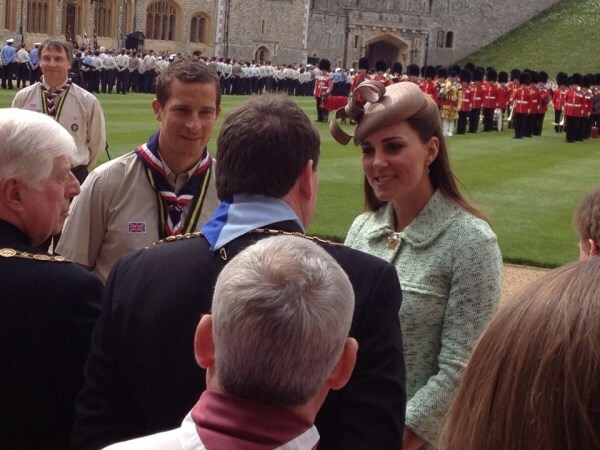 The Duchess has volunteered with the Scouts Association since January 2012; privately where she volunteers with the scouts in Anglesey and publicly having attended a number of engagements to support the scouts, raise awareness and further familiarise herself with the organisation. 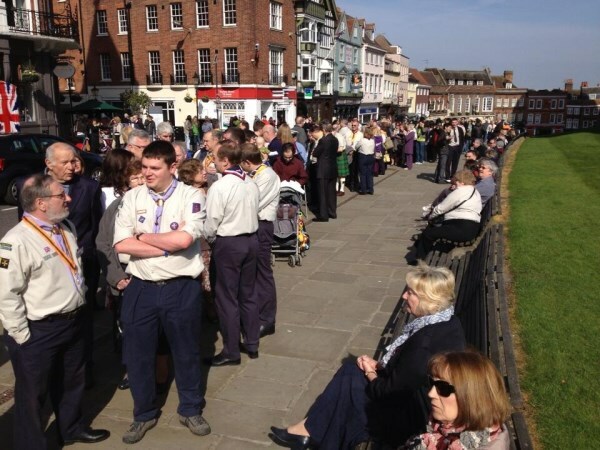 Karl Cooper kindly shared a photo of the very long queue outside Windsor Castle before the event began. And a view of the grounds. The Duchess was presented with a bouquet of flowers by two young scouts as she entered the grounds while The Irish Guards and Scout Band played a wide variety of songs including 'New York' and 'Star Wars'. 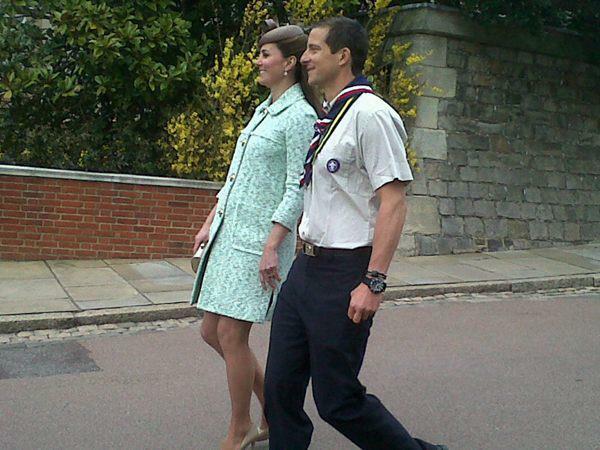 Chief Scout Bear Grylls escorted Kate today and spoke to Sky News about her involvement and belief in Scouting describing her as an "inspiration". A smiling Kate watched the parade. Kate enjoyed talking with some of the 400-plus Queen's Scouts from around the UK and Commonwealth and met gallantry award holders, who have been nominated for their bravery and heroism and meeting adversity in their everyday lives. 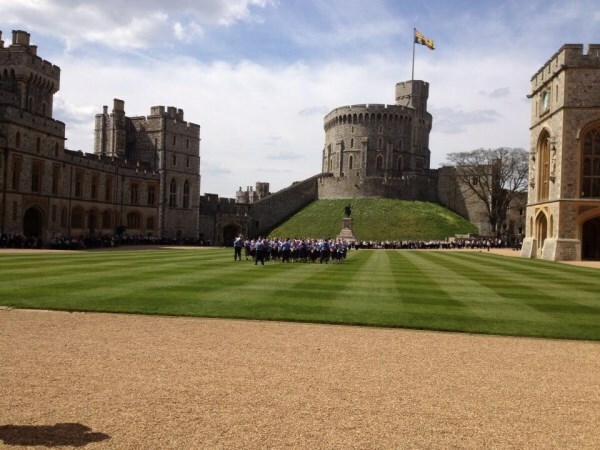 The annual National Scout Service and Parade dates back more than 80 years and recognises the outstanding achievements of both adults and young people through a parade and service held annually within Windsor Castle by gift of HM The Queen. 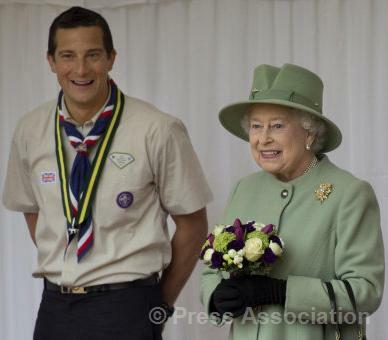 The Queen at last year's parade also with Bear Grylls. 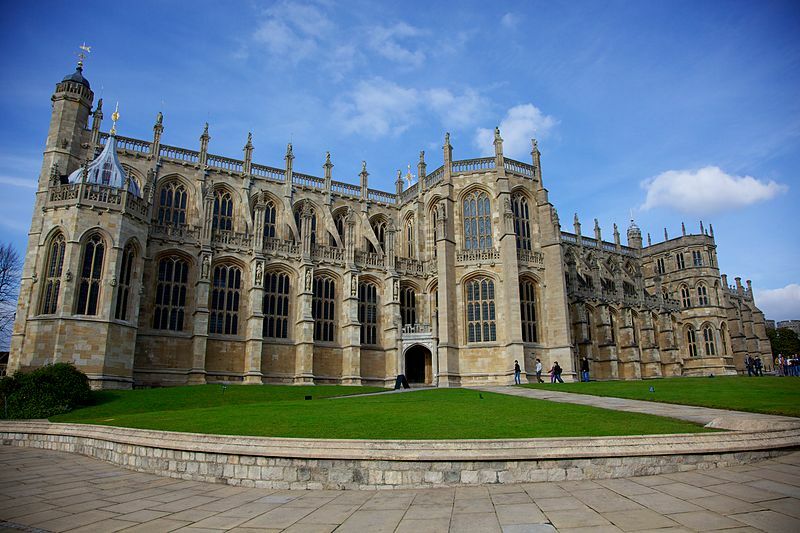 After the parade the Duchess also attended a service at St. George's Chapel, the place of worship at Windsor Castle. The programme cover for the National Scout Service. 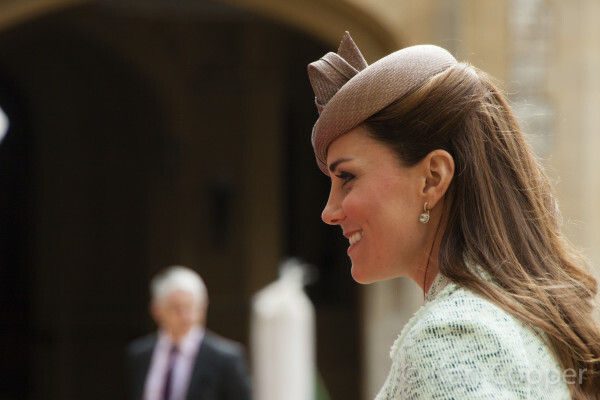 Kate joined members of the Royal Family for Her Majesty's birthday tea in Windsor Castle. I was interested to read in the Telegraph that the Queen has completed over 15,000 official engagements since 1984. As Her Majesty approaches her ninth decade she shows no signs of slowing down. Today is a very rare day off for the monarch and I hope she has a very, very happy birthday. 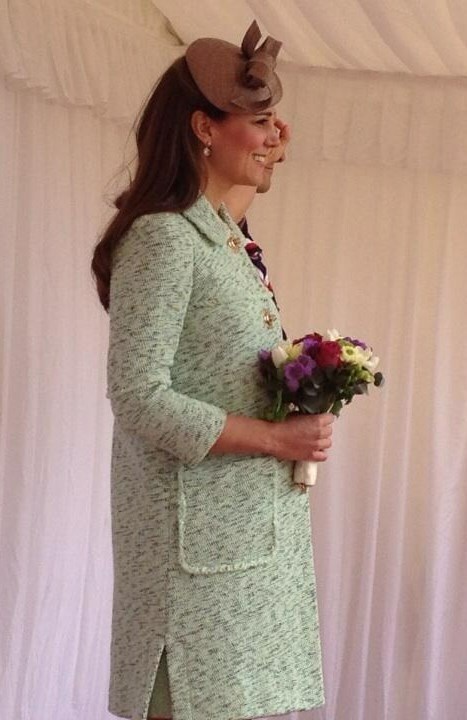 The Duchess elected wear the Mint Cotton Tweed Frayed Coat by luxury English fashion brand Mulberry. The €2,300 coat is 100% cotton and features four flower buttons in soft gold, two large pockets, frayed fabric panel detailing and lined sleeves. It's a beautiful, refreshing colour and a very appropriate choice for the event. Another striking addition to Kate's collection of coats. 'New floral-inspired postman's lock detailing decorates this pretty tweed coat. A soft round collar and classic cut is contrasted with oversized pockets and frayed edging for a cool, easy to wear outerwear piece'. Kate wore a matching green dress underneath, we didn't see it as the Duchess didn't remove her coat. It's thought to be another Mulberry piece. Kate wore her Whiteley Cappuccino hat. The Duchess previously wore the the piece at the Epsom Derby and Emily McCorquodale's wedding. 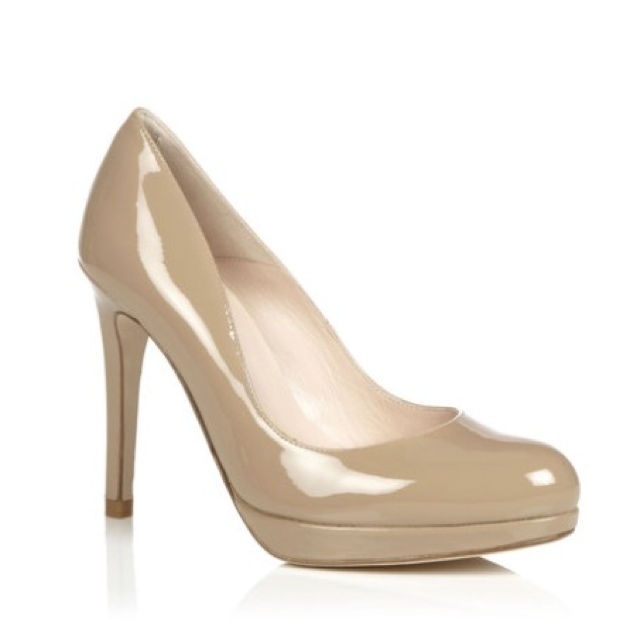 Kate wore favourite taupe L.K. Bennett Sledge Pumps. The sophisticated four inch heels are currently available at Shopbop for €274/$345. The Duchess carried a new clutch today; the L.K. 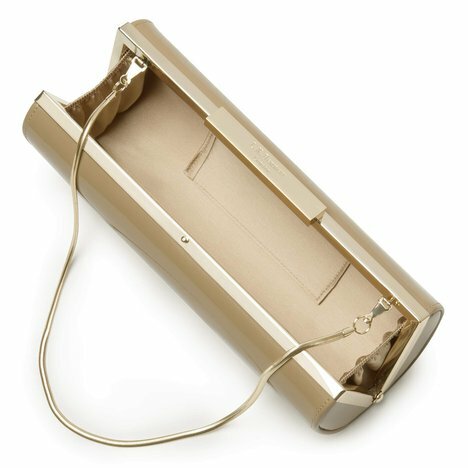 Bennett Avona patent leather long roll clutch (with thanks to Ashley Marie) is available for £195 in a variety of colours. 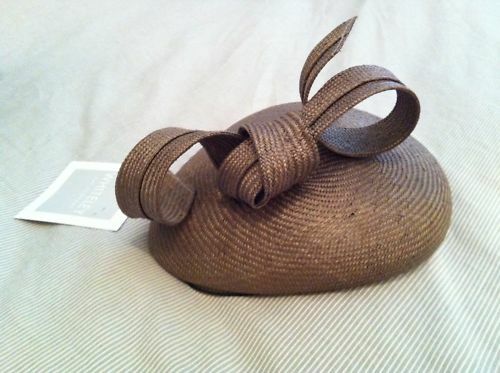 I believe Kate's is taupe. It matches her Sledge pumps and I expect she'll team the two together frequently in the coming months. 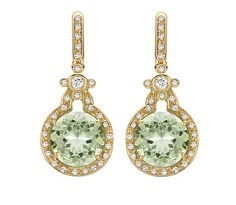 Kate completed the look with her Kiki green amethyst earrings. One can watch a video at the BBC. Today marked the first of five engagements for the Duchess over the coming nine days. We'll next see her Tuesday when she visits The Willows Primary School in Manchester to launch a counselling programme for one of her new patronages, Place2Be. With special thanks to Karl Cooper for the use of his lovely photos. Again a flashing light speed post, thanks a lot Charlotte!!! You're amazing, it's always great to read your blog, keep up the very good work. Love love love the look today! She looks amazing. Kate looks lovely today. Great maternity coat and I love the color. I love the Scouts too I'm sure she had a wonderful time. ( Baby Cambridge Family) can't wait to see the surprise. Happy Birthday Queen Elizabeth. !!! Could it be Baby Cambridge Forum? Hey Jean and Sarah! Jean, that was my first thought....Baby Cambridge Forum. Guess we'll see!!! I was thinking it was B______ Catherine Forum. I can't think of a first word. Charlotte always sees to be writing for the world not just gearing it for Great Brittan so I don't think the B stands for British and since the blog is devoted to Catherine I would think the C is for Catherine not Cambridge. Hello Sarah, Jean & Kate- I totally agree with you three. I think it is going to be Baby Cambridge Forum. Whatever our Ms. Charlotte has in store for us, we know it will be something very special. I can't wait. She is adorable and this colour suits her!! Thank you again for your great post..
keep up the good job!! Very quick post, thank you Charlotte! If I'm remembering correctly, Mulberry was also the brand that designed her green "peace" printed dress, worn at the National History Museum. I remembered thinking then that the look was one of her worst - frumpy and dated. Now, she's wearing a Mulberry coat and I hate the look once again! The print looks like a 1970s upholstery and the buttons look juvenile. I can't believe people pay so much for these Mulberry pieces - at that price there are SO many other options! Okay time to say something positive :-) The event looks like it was a wonderful day, and how great that the duchess was able to take over an event from the Queen. Good idea to start transitioning some duties from the older generation to the younger royals. Happy Birthday to the Queen, a truly inspiring lady! Her work ethic/sense of duty is awe-inspiring. i don't understand why Kate refuses to wear maternity clothes. Well, looking at her in this coat, I don't think she really needs to just yet. She looks fine, IMO. I love those shoes and I almost treated myself to a pair yesterday. :) But I do think the coat would look "younger" with a different hat. This one is not my favorite because it's too "stiff". A softer look would make the overall look more Spring-like. Having said that, I do think Kate looks happy and healthy and that's all that matters really. Are the shoes the same as the ones she had last year? They look a slightly different colour to me. She must find them comfortable. I don't understand it either. Her belly pushes the dress forward, and because of that the dress looks shorter. Too short if you ask me. Lovely and quick post, thanks Charlotte. BCF is baby Cambridge F....... Im really curious now. I agree that Catherine is an inspiration; she inspired me to start volunteering with the Girl Guides last year. I now volunteer each week with my local Brownie group and am overwhelmed by how rewarding it has been! Kate really spoils her outfits lately with the length of her coats. They just look as if she's 'outgrown ' the length like a child does after a growth spurt! On the model in the picture the length is on the knee. From shoulders up she looks lovely. Susie. Manchester. Yes, I noticed the same, that the model has it longer(and looking better)than Kate has..she shortened it? Since the model has rather long legs too ..
I´m not very fond of the contrast of bare looking legs and a shorter coat from heavier materials, I had same issue with the Missoni coat. However, mint green is one of my favourute colours, it looks springy, and I like her new bag and "old" earings, perfect match. It does seem shorter, but I don't think she had it shortened; the proportions seem the same. I think "catalog models" are usually 5 feet 7 inches tall (~170 cm)? I know I always "picture" things 3 inches shorter on me when shopping online or from catalogues because I am 5 feet 10 inches (~178 cm). How tall is the duchess? I would think the baby in the middle is making it go out more and has the effect of shortening the coat. I think the colour is unusual but looks lovely and spring like - I wonder how far in advance she planned/plans her maternity wardrobe...can't be easy with our changeable weather!! I must say I did not like the way the coat looked. It seemed too old and too frumpy on her. I think the surprise might just be Baby Cambridge Fashion. Do you know if Kate attends any events in May? I am wondering if they will go on a short holiday before the duchess takes on anymore engagements for May. Just a thought. Lovely--spring-like colour and a nice length. Sensible girl is not wearing vast tents or stretchy things which look as though they would be uncomfortable. The dress is pretty too and both would be wearable in those difficult weeks after the baby is born. Yes, a very important point Jean from Lancs! Maternity wear can be quite voluminous and it's nice to have some regular - but forgiving - clothes for the weeks following the baby's birth. Another great post on our beautiful Duchness. She looked just stunning again today. I loved her dress and all. Nice length and color. I think you are going to let us know what William is going to do in the future. Or maybe the gender of the royal baby. Whatever it is going to be it will be exciting. Thanks again for another great post. Beautiful look today young and fresh. Your blog is set as my home page the minute I log on Charlotte. You are as fast as usual, Charlotte. Thank you for another wonderful post. I'm delighted to see that Kate looks very well, and of course, to see her growing baby bump. I like the color of coat, very spring-like and it suits her. And her LK Bennett pump is my favorite of all time. So, I'm glad to see her wearing them again. Her new clutch is also very lovely. Looking forward to seeing her on tuesday. Have a nice sunday, everyone! What a great event the Duchess attended today! I think this service is such a wonderful thing for these Scouts and I love that Catherine is so involved with them :) Her skin and hair look flawless! Pregnancy hormones and pre-natal vitamins perhaps?? Whatever it is, she looks radiant. I am with the minority regarding her choice of coat in that the style just seems way too old and frumpy to me, BUT the color is fantastic on her. All in all, she looks beautiful and most importantly, healthy! I can't wait to see all of her upcoming events! 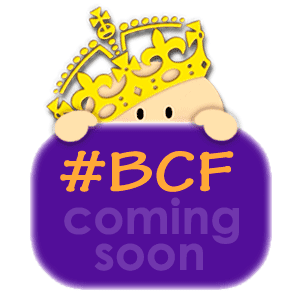 Also I am thinking BCF stands for Baby Cambridge Fashion? I wonder how she manages to walk along the grass in heels and still look so graceful?! I'd be sinking into the grass with every step I took!! Happy birthday to Her Majesty the Queen! As for Kate she is a beautiful and radiant Mum-to-be. Thank you so much for this wonderful post, Charlotte! Aaah she looks so happy and healthy! BCF...Charlotte I'm intrigued! Can't wait for next week! My tickets for the coronation exhibition at the palace have also been booked as well as a trip to the Ritz for afternoon tea to celebrate my sister's birthday! I'm very excited! I first saw the photos on the Daily Mail's website and almost half the comments were about the length of Catherine's coat. I love the color and style, but just a wee bit longer would have made a huge difference in the overall look. She does look radiant, happy and healthy though. She buys "off the rack" and most clothes are made for women not quite as tall as Kate. Perhaps that is the difference. In comparison with the unfortunately short length of other coats she has worn recently, this coat's length is a decided improvement. She's not as tall as some people claim. I think she's not much over 5'8". I agree with you, Carol. A couple of added inches (say two inches in front and one inch in back! )on the coat would have pleased me, but she did look radiant and beautiful. I'm the same height Kate is, needless to say buy clothes off the peg, and have no trouble with length. Kate's taken a coat that the picture shows is meant to be worn as a top coat with trousers and is wearing it with a dress. The colour is wonderful and there is nothing inappropriate this time about the length, but it does nothing for her. It makes her look more stout than she is at this point, and her knees look knobby. Such a pity because she used to dress so perfectly, even before she married. It's some idea she's gotten mainly since she was starting to really show. I think she will look back at the photos in hindsight and wonder 'what was I thinking!' Pity Mum doesn't put her right. Carole always dresses well. What a wonderful post!!! Kate is absolutely beautiful! She looks happy, healthy, and radiant! 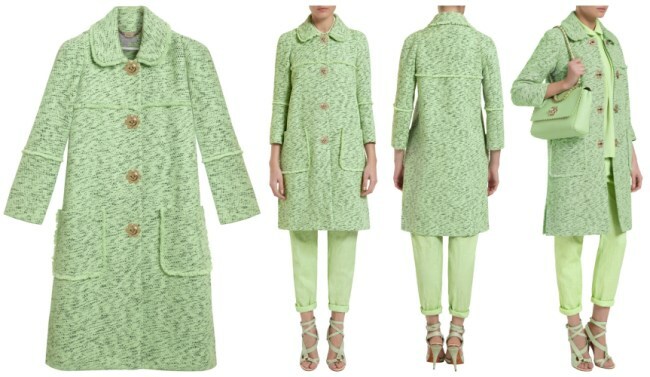 While the style of the coat will have to grow on me, I thought the color was lovely and very spring like. She just radiates happiness! 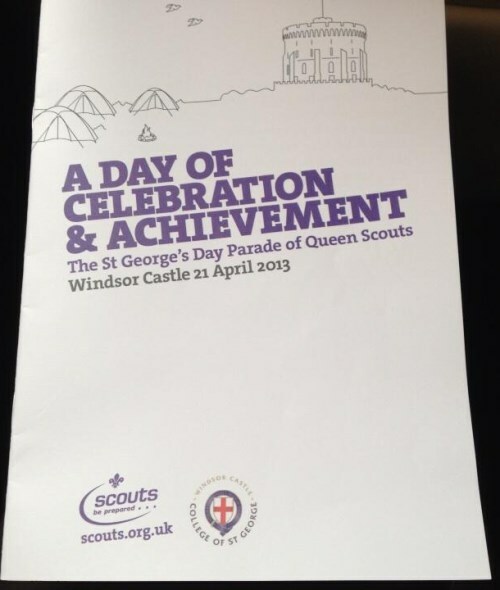 I'm am sure it was a wonderful day and the Scouts felt honored. I am a former Girl Scout and was a troop leader before having children. It is an absolutely fabulous organization and great way to invest your time. I hope HM has a glorious birthday!!! She deserves a wonderful day off after giving so much of herself. She is a fabulous example of dignity, steadfastness, and strength. Although I am not a British citizen or member of the Commonwealth, she is my Queen. Someone who I have grown up watching and a lasting figure in our world. I hope she will be blessed abundantly this year! BCF.....I posted above and replied to Jean and Sarah, but thinking Baby Cambridge Forum??? Baby Cambridge Fashion??? Baby Cambridge Fun??? Baby Cambridge Followers??? So excited to see what you have in store for us Charlotte! It looks like it was a beautiful day in Britain! Windsor Castle is absolutely beautiful, but adding the always gorgeous Kate and the Scouts to that along with a birthday celebration, seems like a fabulous day! I hope you all are having a beautiful day from wherever you are reading from!!! Enjoy!!! Ah, it is not “BFC” but “BCF”, I think I really need glasses. Okay, so let’s get some help from Sherlock Google again: “Banque Cantonale de Fribourg”, “Boat Camping Fishing”, “Baltimore Community Foundation”, “British Culinary Federation”?? Not better. Lol these are making me laugh! I also like "Sherlock Google", very clever! Thanks so much for the speedy post, Charlotte! You're the best!! I actually think the length of the coat is just right for Kate at this point in her pregnancy - much better than the tartan in Scotland. I think the mint color is lovely on her, but I'm really not a fan of the huge pockets on the coat. I love the hat, but not quite sure about pairing that hat with the mint green. Overall, it's nice to see the Duchess in something that fits her well, shows off her baby bump, and is an appropriate length. I'm also happy to see that her face is filling out, which to me means that she's staying healthy and eating right during her pregnancy. Can't wait to see what the surprise is this week!!! I think the coat looks like a house robe and that has always been my last favorite hat of hers so this was one of my least favorite outfits. Good to see her out working though. Absolutely loved the mint green color,, she looks radiant with the mummy glow :)saw her do the left handshake in the bbc video, is this handshake done for all scouts or just scout leaders? BCF hmmmm I'll go with baby Cambridge features. Although I enjoyed reading the other guesses also,, thanks. Charlotte for this quick update, and a very happy birthday to her majesty!! Great post! I liked her outfit not my favorite but I really do like the color on her, the color is a nice change from her recent stuff. I'm surprised by the comments that the coat is too short. This coat length almost looks matronly compared to the tartan one she wore in Scotland! Personally I think it's the perfect length for the transition to warmer spring weather. I like this coat a lot, especially the color, and this is coming from someone who did not care too much for that blue Missoni coat Kate has (not a fan of tweed). I was brainstorming what we might see our princess wearing for the reception on Wednesday. Wouldn't it be lovely if she recycled the lavender McQueen she wore to the BAFTAs? With a little adjustment of the belt there's plenty of room for her tummy. I'm not sure what it is exactly, but I'm not crazy about that coat. Not sure if it's the length, the buttons, the fit, or the color...but it's nothing that I would have paid all that money for. Still, she looks great. I'm glad to see her looking so happy and healthy. It has to be tough to go through pregnancy in an international spotlight. I was wondering why she shook hands with her left hand, and then I watched the BBC video, which explained it was a scout tradition ! How extraordinary ! Do you know anything about that, dear Charlotte ? I loved seeing her so happy and radiant. Loved the color of the coat, but not the styling or the fabric. And in my opinion it is once again too short. The proportions are just off. Thanks for the great post! I'm excited about all the upcoming engagements this week. Thank you in advance for your hard work in keeping us informed. I must say I'm not a fan of today's outfit. I have never really liked that particular hat. The Mulberry brand doesn't appeal to me, especially their green palate. I don't like the coat's shade of minty green and never liked the Mulberry green silk dress Kate wore to the Treasures Exhibit. But Kate makes them look good. Just noting that 2 of the 3 British appointees to the Time Magazine Most Influential of 2013 are Kate and Hilary Mantel! I'm surprised I haven't seen anyone else comment on it given the scrap over Mantel's earlier comments about Kate. I think both are worthy of the recognition. I laughed at Prince Harry's sibling quip at the London Marathon. When asked why Wills and Kate weren't running, he replied, "He's old. She's pregnant." Typical little brother! After the London Marathon and a big marathon today in Toronto, I'm thinking of Boston and hoping all the wounded are getting better and trying to come to terms with all that has happened this week. Best wishes to the USA-they are good people and great neighbours to Canada! Harry is so cute :) I was so happy to see him wearing a black ribbon in support of Boston. Such an incredibly brave city. Thank you Canadian and British friends (and many more) for your kind comments this past week. So much tragedy and sadness. I think I can speak for all Americans that your kindness means so much. Many prayers are being lifted up! I generally feel something is lacking with Kate's styling. If she just tweaked things a bit she would have more home runs. I think the length of the coat is too short - better than the other coats she has recently worn but just at the knee would have looked better or she could try wearing dress pants with these shorter coats. Sophie - Countess of Wessex wears pants on occasion to events. I don't care for the hat with this outfit - its just meh to me. I think something in a lighter color, more springlike and not flat against her head. Maybe, she just didn't need a hat? Hair in a sleek pony tail? I love the way that she commits herself to the events she attends. She is always very focused and clearly looks like she is enjoying herself. She does look very radiant and happy. Good for her! Always wishing her the best! Yes she did need a hat--she was reviewing a parade and then going on to a service in St. George's Chapel. Oddly, I didn't care too much for the hat when she wore it before, but thought it was great with this outfit and this occasion. I remember trying to find a hat for a wedding when I was pregnant--when I tried a large one, I looked like a Man-o-War in full sail! Hats are a great accessory, worn far too rarely these days. I may be wrong but I think most of the posts going on and on and on about the short length of Catherines clothes are not British - this is a fashionable length in this country, but more importantly I still have not read a valid reason why a pregnant woman has to wear "longer" clothes. I love the colour of the coat (spring like) and the fringeing. The buttons seemed to ring a bell and then it dawned - the Mary Quant "daisy". anyone on here who is either as old as me or who has studied 1960/70s fashion will recall that daisy! I thought everything she wore worked together and was appropriate for the occasion. About the dress. It isnt the Reiss. I've seen some close up pix of part of the dress and it is embroderie anglaise - very like the material of the pale lemon dress from the last tour (the one she had a hand in designing). So I was thinking that maybe she has had this dress made to go with the coat. The colour is a really good match. Many thanks Charlotte for this blog - definitely the best. There was a *major* lack of photos from the event, particularly high resolution. It must be because the event took place in the grounds of Windsor Castle. I imagine the dress must be another Mulberry piece, hopefully they will confirm it. As you said CP, the colour is an almost identical match. I am not British and I think the length of the coat was appropriate. I think many of those posting about the length of her coats in recent months are older. Tall, pregnant, off the rack, etc., who cares? I think she looks great! There's also this pesky thing called "royal protocol" which says hemlines should be at the knee. Kate flouts it constantly. Like the color - too short again however. Even leaving the coat the length it is but showing the dress below it by about 4-5" (10-12cm)being as the dress was a really soft material, would have helped a lot. Know what she was going for with the hat - trying to pull off a little scouting barre type look - but it sort of came off like an after thought. Hard as she does not want to look matchy- matchy. Least the hat looks better than if she had pulled out that HORRIBLE one from their south seas trip - Jane Taylor off white straw one with little turquoise crystal beads (most did not see on it) paired with the geometric Jonathan Saunders, the Evelyn dress (one of the least fav looks on that entire trip)...so could have been worse - she could have pulled out that hat to recycle! I also don't know how she manages her 4" LK sldg. pumps on lawn. I sometimes wonder if she has a couple pair that are not a full 4"? I still would sink into the lawn even if they were 2 or 3" - this yr the short heals (and kitten heals) are big - be nice to see Kate make an addition for summer of a couple of those for these kind of occasions as well as some casual days - don't want to see a summer of espadrilles again. I was wondering too about her walking on the lawn with these heels. Did a little exercise myself today. (My boyfriend and I are wedding guests the coming weekend and there you also have to walk a little on the lawn to get to the church... So I thought this was a good reason for trying it.) If you don't give the full weight on the back when you are walking then you don't sink in. You have to have a feeling for that. Of course you have to put a little weight on the back if you don't want to look walking like a duck. But it has to be so little that you don't obviously sink in too much. I tried it for half an hour until my dear friend Leah saied it wasn't looking strange any more. So if you have the feeling, you can manage that. So now I know how to rock the lawn with heels. Yeah! By the way: Charlotte, you are doing an amazing job with this blog. I don't have time to comment that much but I really love love love it here!! Thank you for this great post, Charlotte! Nice to see Catherine looking so radiant today! I love the color, but this coat looks something the Queen would wear. And by that I mean, I don't think it matches Catherine's age. The hat is one of my favourites! The first time she wore this hat, at the Epsom Derby, she was the epitome of class and grace! Best regards from São Paulo! Love this look but still don't understand, even though yes, she's got great legs, why all of these coats and dresses are so short. If you're going to spend $3,000 on a coat, take it to a tailor and get it tailored to fit properly. The coat on the model in the photo, who likely is considerably taller than Kate, hits right at the knee, which would be a perfect length for Kate. But this is a good look and eminently recyclable for use after the pregnancy. I do hope the Queen and Prince Philip are both OK, since various reports only briefly mentioned that she's marking her birthday "quietly." Are you doing a Twitter feed with the hashtag BCF? Many good guesses for the acronym. Not your monogram, is it? Love the color of the coat, not sure what to think about the style. A bit too mature for her. I just watched the video from the DM and it seemed a little funny to hear New York, New York being played outside of Windsor Castle. :) Looking forward to a busy week full of engagements and blog posts!!! Great post Charlotte - I love your blog! Not my favourite outfit of kates, but it definitely seemed like a lovely day. Just a quick question. I noticed in a video of the day that Kate was shaking hands with people with her left hand - is this common? Does she usually do this and it's just the first time I've noticed it? Seems strange. And Happy Birthday to the Queen of course! I also noticed the hand-shaking ! Very strange... But if you watch the BBC video linked, the commentator says it is a scout tradition, which I still find very strange. Really odd... I agree. Her Grace and style though is absolutely Divine! I love this blog and I love her. I am so excited that she's having a baby. I wish them all the luck in the world. About the short coat. This isn't the stone age. She's a young lady and it is s new monarch. Let's try to embrace it. Why does everyone have to be so critical all the time. I don't think propriety or modesty is the issue for many who dislike Kate's look with this coat. It's that it just looks bad - as though she didn't give a thought to having it tailored to fit her new shape and size. It really doesn't make sense to spend so much on any piece of clothing, then wear it sloppily. She might as well have just bought a cheap $50 coat from some UK version of Target at this point. If skipping a tailor is her way of being "trifty," I'd say she's failing to make her point in a big way. I thought that one of the purposes of this blog was to discuss the fashions worn by Duchess Catherine, to comment on what we like and what we don't like and why. Am I totally off the beam? I don't think the participants on this site are terribly critical at all. Most are immensely complimentary, in fact. At the risk of being deemed a critical blogger (I'm NOT; I'm the first to heap on the praise when I like an outfit! ), I have decided that the problem I have with the ESTHETIC PROPORTIONS of the shorter coat really has less to do with the length of the coat than with the height of the heels worn with the shorter coat. A chunkier lower heel would better balance the "look," I think. Love that coat! Definitely one of my favorites. Between Kate and Queen Elizabeth...what amazing and inspiring women they are, each in different ways! The "Daily Express" is quoting the Chief Scout as saying that Catherine has been with the Angelsey troupe twice since she was on the training day in Cumbria and around half a dozen times this year. Some women can't wait to wear maternity clothes, showing off their belly, even when there's not much yet to show. Duchess is certainly not one of them, perhaps she considers it to be bad taste to highlight the 'bump' like celebrities? She seems determined to wear normal clothes as long as possible. And I must say that it really doesn't work for her. I'm sorry to say that but she's never looked so poorely. Apart from that red Armani coat all her clothes have been much too short. Sometimes it's bordering on silly. She's a grown up, pregnant woman in certain position,representing her country and monarchy, but she runs in mid thigh coats and little dresses when attending formal occasions. Maybe it sounds harsh but her job is to support charities not to show off her legs. I think it is strange that she her hemlines have gotten progressively shorter after her marriage. When she was younger and a non-royal she was actually a more stylish and conservative dresser, with hemlines touching the knee as most women in their 20s and 30s have. It is only after her marriage that she has started wearing these short hems. Hello! featured an article on pregnant royal ladies (over the years) and I noticed that Victoria wore some *very* short dresses during her pregnancy. Nothing wrong with that. She's a young woman and the dresses were tasteful. Have to admit the coat's not a favourite although I love the colour. Looked much better on the model. The pound sign before BCF puzzles me. Does everyone else know what it means? I'm not clever with computers. Could it be a link or an Ap? On WKW site, it showed the dress being a borderie anglaise. Maybe there was a private party for the queen afterwards and Kate planned to take her coat off. Could have been made by that same dressmaker who did the yellow one on the tour. Overall, an outfit that managed to look too dated and too young at once. But Kate looked radiant and it's a wonderful, important occasion. Love how she did her hair. To me, she always looks better with her hair up. Wish we could get a closer look at her hair. Thank you so much Charlotte, have a great week! Is this her mom's coat? The issue with hemline is proportion. Sometimes her shorter clothes make her look like she is imitating a small child's clothing proportions and it looks odd on a woman dressing for professional or ceremonial purposes. They look like nightclub clothes. I agree that if you are buying expensive off-the-rack clothes and they don't quite fit right, go to a tailor to adjust the fit. The clothes can be taken in later, post-pregnancy. No matter what, the hemline should be even all the way around and not shorter in front because you're accomodating the bigger belly. The mint is a nice spring color, refreshing after the deep and dark colors of winter. It looked very much like the clutch she carried to the Orchid Gardens visit in East Asia last September. Another blog says this is a new item this spring. You bloggers would sure know better. Do you know what time start today's engagement? I'm not fond of the style of the coat because it ages her terribly. The color/pattern is pretty and spring-like though. I also love when she pulls her hair back--it annoys me that most pictures we see when her hair is down has her pushing it back from her face. Overall this outfit is not one of her best. I prefer her tartan coat from Scotland earlier this month even with the short length! My guess for the #BCF is Baby Cambridge Fashion! I know "British Children Fashions "